But the inspiration for our blog on MTV’s “Teen Wolf” isn’t from a song, but from a mid-1980s film of the same name starring Michael J. Fox as Scott Howard -- a high school student who has inherited a unique family trait. You see, Scott has the ability to transform himself into a werewolf with extraordinary athletic powers, which enables him to lift his basketball team from the depths of mediocrity to the high school championship basketball game. And along the way, his werewolf status has enhanced his popularity in school, especially with the girls. 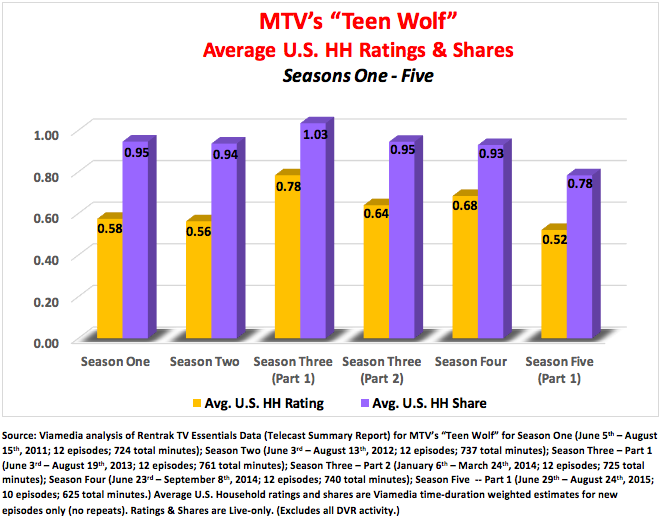 MTV’s television series of the same name (and now in the middle of its fifth season) stars Tyler Posey in the teenage werewolf role (Scott McCall) with a bit of a twist. Unlike the original Scott Howard, whose werewolf status is inherited, Scott McCall came by his status the old fashioned way – he was bitten by a werewolf. And unlike the original movie, which in essence was a light-hearted comedy, the MTV version leavens the comedy with darker (and more graphic) elements that transform the teenage high school experience into something scary and (at times) quite bloody. 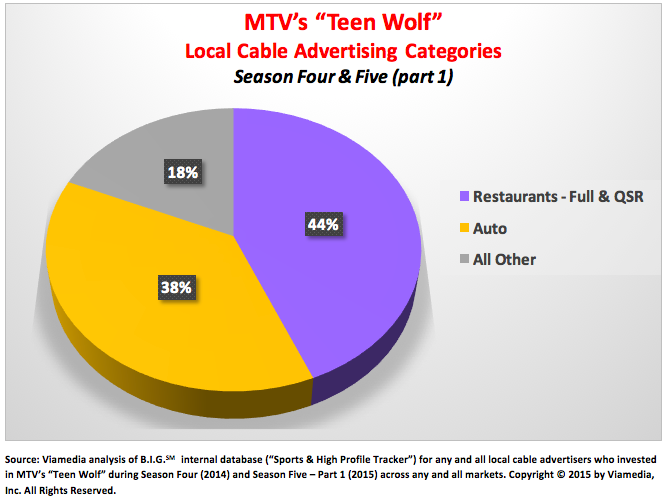 Over the past two seasons, forty advertisers across 20+ Viamedia markets have ordered 160+ :30-second spots in Teen Wolf.” That comes to an average of about four spots per advertisers. 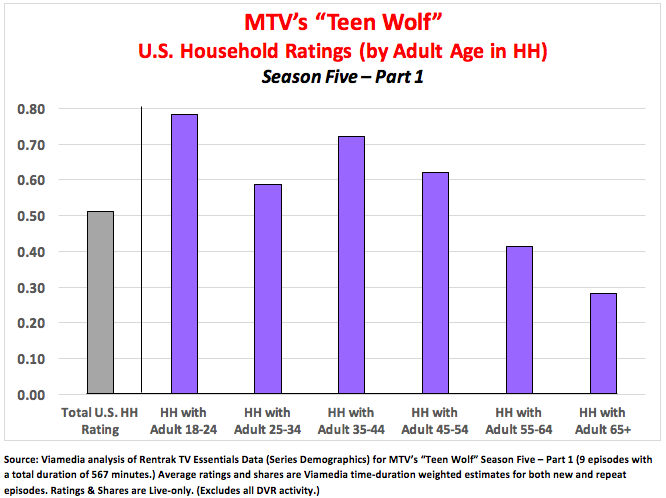 The programming bigwigs over at MTV have thrown a few curveballs to viewers over the past few years, (which certainly hasn’t helped “Teen Wolf’s” ratings.) Season Three, for example, premiered in the summer of 2013 with a dozen episodes, and then went on a hiatus for several months before returning in the winter of 2014 (with a dozen more episodes.) But did the programmers follow suit with the same split in Season Four? Nope – they just aired a dozen episodes in the summer of 2014. 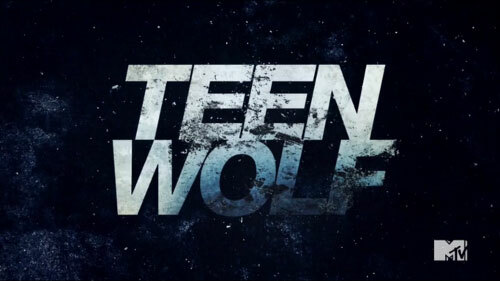 But when Season Five came along, they decided to split it again -- just like Season Three, the difference being that when the current season starts up again in early January, 2016, it will be a continuation of a narrative begun last summer in which Scott McCall and his fellow classmates worry (a la “Glee”) about what will become of them once they all graduate. But graduation is the least of their worries. They face several scary, supernatural forces that may cut short their high school careers long before graduation day.